to windsurfing, speedsailing uses much of the equipment used by windsurfing - the sail and the principles behind harnessing the wind to propel it are exactly the same for a speedsailor as they are for a windsurfer, the only difference being the use of a land based board, similar to a skateboard. 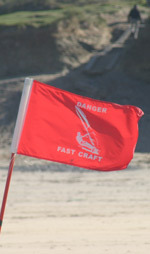 Speedsailing championships are held at World, European and National levels. 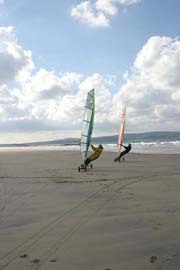 Gwithian, Cornwall, hosts the UK round of the Triple Crown Event with France and Belgium providing the other venues. 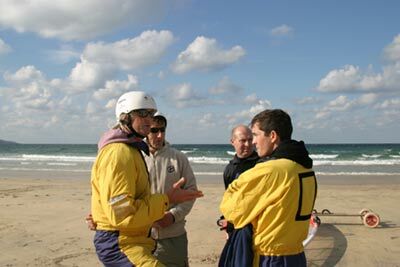 Fourteen competitors including one Belgian and six of the French team took part in the 2003 Gwithian event. 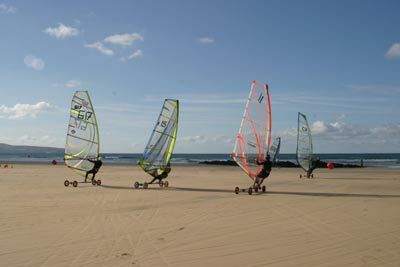 Although many of the sport's current practitioners are also windsurfers, the sport is easier to learn than windsurfing but many of the techniques are directly transferable from one sport to the other so speedsailing provides an ideal option for all those of you wishing to get to grips with the principles of windsurfing without getting your feet wet! Training/fun days are held by the BLSA throughout the year where you can try out speedsailing. Month in Cornwall' and 'What's On'.